Here are the best important tourist places in Kerala, through my trip to South India and the tips of my local friends. You will also learn how to prepare your trip. These two words immediately evoke lush exotic vegetation, the beauty of backwaters, wild fauna, ayurvedic care, colorful festivals and shows, the softness of life and idleness. This reputation, far from being usurped, earned Kerala its nickname “God’s own country”. I spent about ten days exploring the important tourist places in Kerala, before going to Mumbai for the last days of my trip. Where is Kerala + an itinerary idea. The best important tourist places in Kerala India. Periyar National Park in Thekkady, the wildlife sanctuary. How to reach Thekkady and Periyar wildlife sanctuary? Where to stay: Thekkady or Kumily? Why choose Thekkady resorts – Shalimar Spice Garden Kumily? 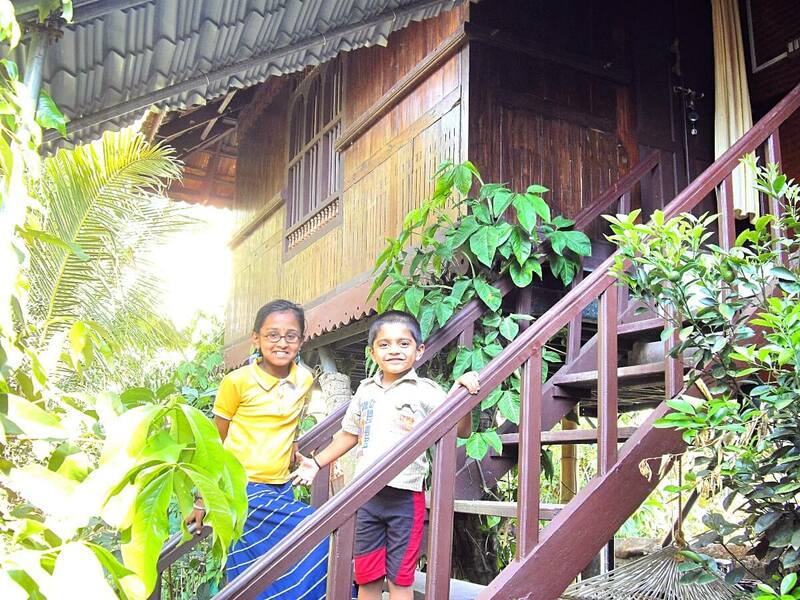 Why choose Thekkady hotels – Jungle Palace Homestay on Lake Road? How to visit Periyar National Park and what to expect? How to visit the Kerala backwaters in Alleppey? How to reach Alleppey – Alappuzha? Palmy Lake Resort – my favourite place in Alleppey. Lake Canopy – one of the best resorts in Alleppey (4 stars). 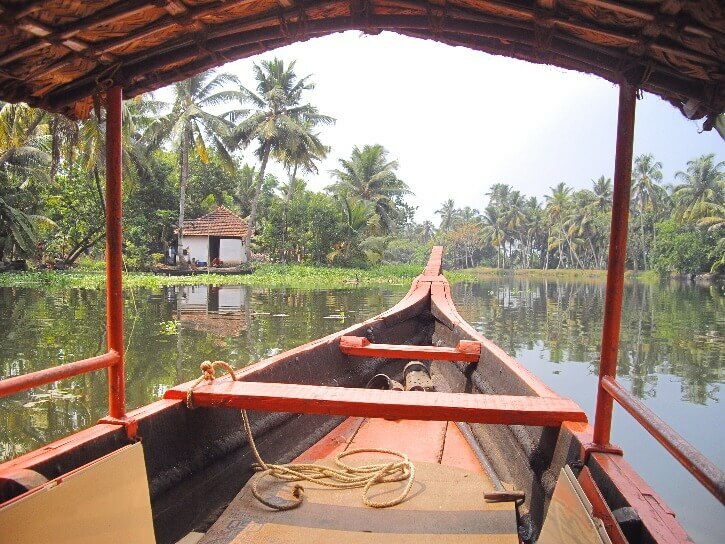 Discover Backwaters and their lifestyle. Experience a beautiful public ferry route: Alleppey – Changanacherry. Places to visit in Kochi, the “Queen of Arabian sea”. First impressions of Fort Kochi. 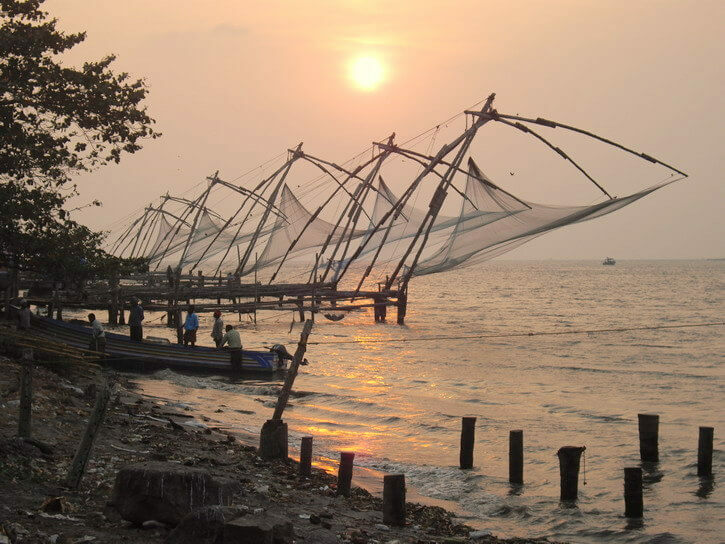 Shoot Fort Kochi Chinese nets – cheena vala. 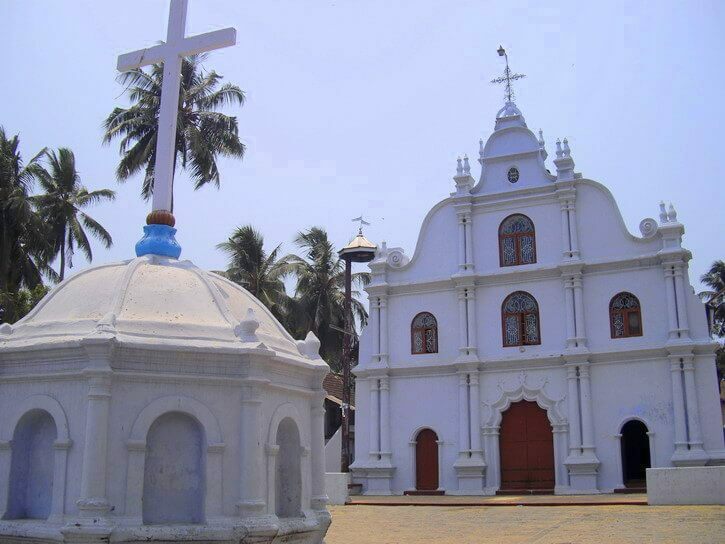 Explore the churches of Cochin. Wander around the Jewish quarter and the Dutch Palace of Mattancherry. Enjoy the Kerala dance: Kathakali show. How to reach Kochi Cochin? 5 star hotels in Cochin – fragrant nature. N°1 on Trip Advisor – Secret Garden (2 stars). Best choice at less than 20€ – Namasthe Fort Kochi. Other places to visit in Kerala, from South to North. Best time to visit Kerala, South India and India. Climate and festivals in Kerala. Best time to visit Kerala. 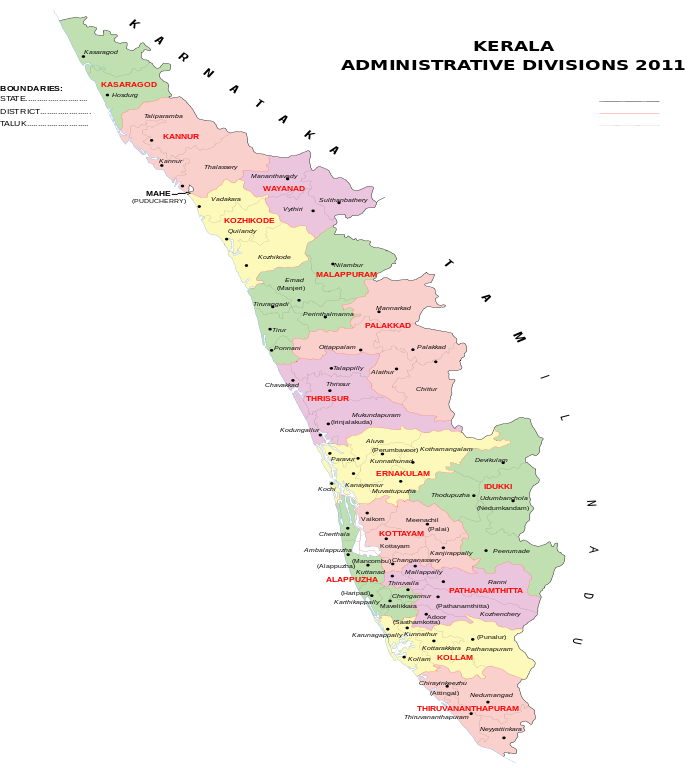 The state of Kerala is located in southwestern India. As you can see on the map, it has a very long seafront. Trivandrum, of its current name Thiruvananthapuram, is its capital. 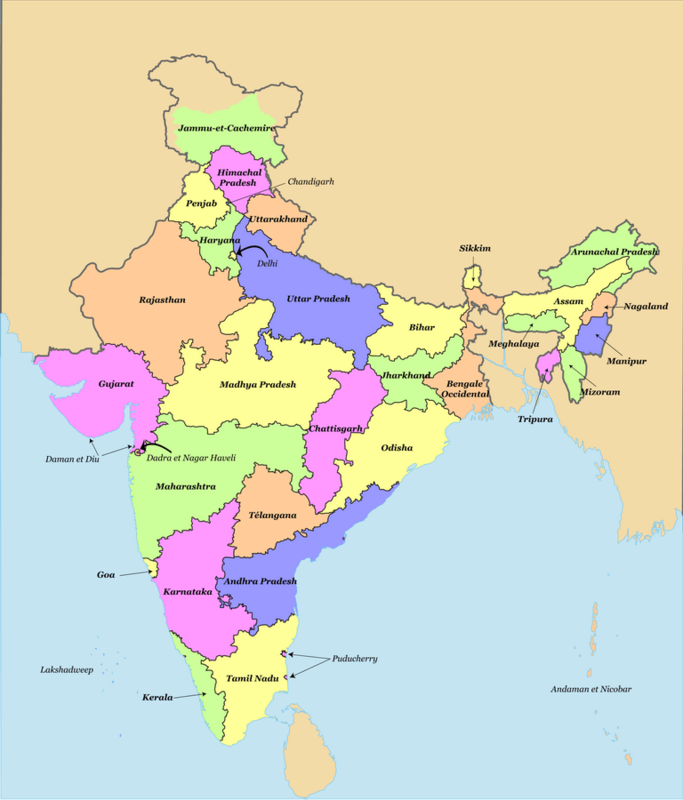 It is bordered to the east by Tamil Nadu and to the north by Karnataka. As I was arriving from Madurai in Tamil Nadu, I concentrated on the discovery of the tourist triangle Periyar reserve, backwaters of Alleppey, Kochi. If I had had more time and had been able to do the complete itinerary via Rameswaram and Kanyakumari, which I mentioned in my article about Tamil Nadu, I would have followed the coast to Alleppey, stopping at Kovalam, Varkala and Quilon. Then I would have joined the reserve of Periyar and Munnar. At the end of this article, you will find a brief overview of these destinations and the reasons to go there. Periyar National Park is a nature reserve, in which you can admire the flora and fauna of India. With a little luck, you can see wild elephants and tigers. To reach Thekkkady and Periyar National Park from Madurai, there are now direct buses to Kumily, the closest village to the reserve. It takes about 4 hours to get there. Buses depart from Arapalayam station, 2kms from Madurai. Munnar to Thekkady is a 4 to 5 hours mountainous road. From Kottayam – and therefore backwaters – count about 4 hours. From Kochi – Ernakulam – count 6 hours. I advise you to stay on Lake Road in Kumily, on the edge of the reserve, so that you can enjoy nature and animals all the time. I was staying in a magnificent guesthouse, with a direct view of the reserve but outside it, Meadow View Inn, a real haven of peace in the middle of nature. I was living in a wooden bungalow they called a tree house. Everything was made of teak wood and bamboo. The window of my large bedroom was overlooking the mountains and the reserve. All day long, I was entitled to a nature concert. I slept with the curtains open so I could enjoy the view of the herds in the morning, directly from my bed. 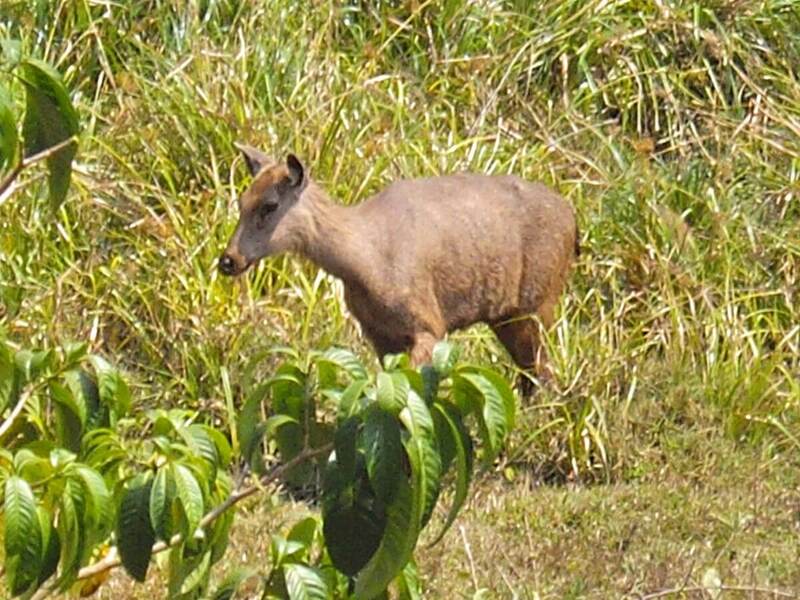 The gaurs, wild boars, wild pigs, fallow deer and birds came regularly to visit us. However, it seems that after changing owners in 2015, the guesthouse is closed. Sateesh and his wife were always looking after their guests with great care and attention. The food was delicious and I tasted the best egg curry here. 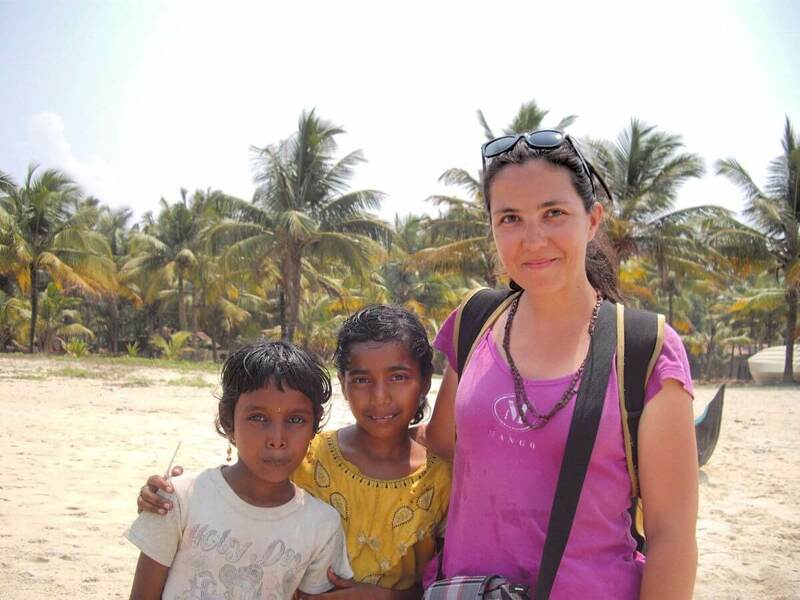 The two children, especially little Amel who spoke several languages and dialects, were adorable. According to the critics of Agoda and Trip Advisor, the new owners spoke rather poor English and had little experience of holding a guesthouse. Pictures of Trip Advisor also show that the place, although still welcoming, has new buildings and more concrete. Sateesh planned to open a larger guesthouse in the middle of the mountains, but far from Periyar. This 3.5 stars resort offers bungalows in the middle of a cardamom plantation and is ranked n°1 on Trip Advisor. The guests rate it 4.5/5 on Trip Advisor and 9.1/10 on Hotels Combined. Check the latest prices on Hotels Combined search engine. Certainly much less chic than the previous one, the Palace Homestay jungle has the advantage of being able to enjoy the view over the reserve and the animals. And it is precisely for this privilege that people come here! The reception is considered very pleasant, the place is clean and three categories of rooms are proposed. In short, it is the ideal address if you want to enjoy the reserve all the time. Read more and check the latest prices on Hotels Combined comparator. If you’re not in a hurry, I advise you to wait until the right opportunity arises. You will meet many retailers and agencies offering visits to the reserve. But if you are patient and don’t hesitate to talk to people, you will surely meet other travellers who will share their best plans with you. For my side, I was fortunate to be there at the same time as a young German who knew the place and the local people very well. He invited me to join Sarha, a Swiss-American from my guest house, for a trek in the jungle. He put us in touch with one of his guide friends with whom he visits the reserve regularly. So we left at 5:00 in the morning. We had two guides with us and we went to a rather unusual part of the reserve… It was dark and we just had the sounds of nature all around us. We quickly had the chance to see a magnificent bird, and very rarely visible, the calao (it lives only in this part of Kerala). It is about 1m50 wide and the noise of its flight is amazing: it almost sounds like a helicopter. It has several colors, a long tail full of feathers finished by balls. Really beautiful. We even climbed up a tree and waited a long time for them to come back: their water point was right next door and they had killed a boar that they had barely started to eat when we arrived. Even though we have not seen them, hearing them and being so close to them has been an incredible opportunity that will surely never happen again in our lives. A little bit later, we made two groups, Sarha was with the tracker. 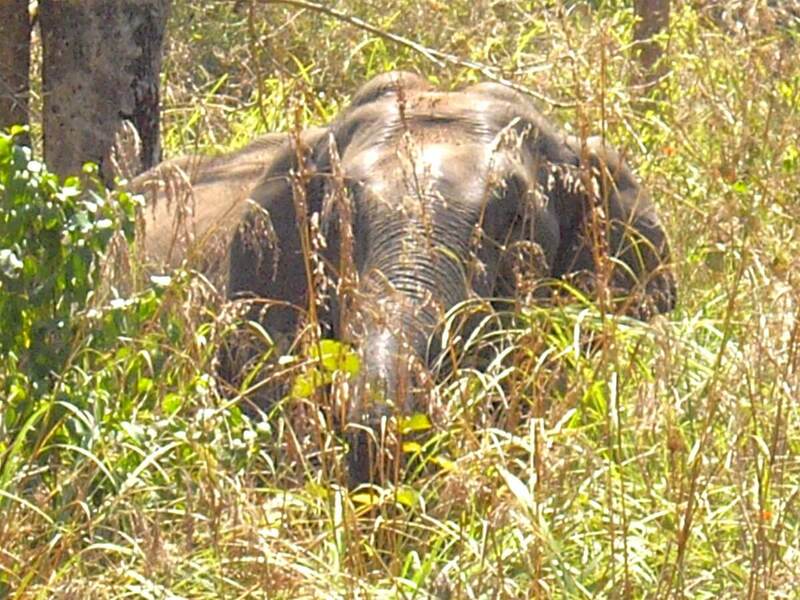 After 5 minutes, he called us: he had just found an elephant! We were able to admire it, a few meters from us, eating the leaves of the trees. Babou, our guide, took branches to hide us behind. When he came out of the grove, I started making movies. What an emotion! All of a sudden, he spotted us and started moving towards us. Babou waved the branches and shouted to frighten him, but it took some time before he impressed him. He ran away and went behind the trees. Suddenly, he started trumpeting… and charging. Babou shouted “run, run”, and we ran like rabbits. Even though he was a teenager, his size and tusks were very impressive. Babou explained to us that elephants in herds are harmless, unlike an elephant alone. This one was very angry. We continued to follow him. It was as if we were in a Jurassic Park scene, where heroes are waiting, hidden as they can, for the giant dinosaur to reappear from the tree that conceals it. Except it was real!!! While I was alone with Babou, a tiger approached a few meters away. The herbs moved around us, before circumventing us and moving away. We also slept around a campfire. The guides cooked us a great dish. They had it all planned out, it was a great organization. They took turns maintaining the fire. Sarha slept very well, I practically didn’t sleep, especially since we had Babu rolled at our feet and I was afraid to disturb him. In the morning, get up early. The boys made us a great breakfast and then we went hunting: buffalo, tracks and droppings of elephants, tigers and even jaguars! In short, Babou was very happy because we saw everything we could see here, and we too of course. As a bonus, the view of the reserve lake from the top of the mountain was magnificent and the morning walk was less difficult despite the fatigue. It was an unforgettable experience that I recommend. Avoid group tours if you can. You won’t regret it! Kerala backwaters are a series of canals in the lush landscape typical of the state. They can be discovered both on foot and on the water, whether staying in a beautiful bungalow by the water’s edge or on a houseboat. Depending on the type of bus you will need 3-4 hours to get from Kumily to Kottayam. The landscape is superb, punctuated by tea plantations and houses with typical Kerala roofs. Then, the public ferry will take you in 2h30 to Alleppey, offering your first visions of backwaters and life along the water. If you are like me and consider that your travels are an integral part of your trip, you will enjoy this trip! Sateesh, the owner of Thekkady’s guesthouse, had booked a bungalow for me at Palmy Lake Resort. I really liked this lovely tropical garden on the edge of the backwaters and the lovely Macy, the owner of the place. I could easily eat a delicious dish of spicy shrimp with parrotas in town, at one of the restaurants in the centre I discovered when I arrived, or ask Macy to prepare a meal for me. Unfortunately, Agoda’s pictures do not do justice to the place. However, you will see nice pictures taken by customers on Trip Advisor. Check the latest reviews and prices on Hotels Combined search engine. For those looking for luxury and a swimming pool, while being on the edge of the backwaters. The establishment offers rooms and cottages and is ranked No. 1 out of the 70 hotels in Allepey – Alappuzha. Read the latest reviews and check the latest prices on Hotels Combined. For your final choice, be sure to look at the available surface area and whether or not you will need to share the houseboat. Prices normally include all three meals but it’s better to check. In order to see the offer and check the price, use this link and choose “boat” in the hotel categories on the left. You can easily discover the backwaters while staying on earth. As Palmy Lake Resort is located on the canals, I regularly went for walks or public ferries. Macy organized for some of us a pleasant wooden canoe ride. All these modes of transport allow you to discover the life of the backwaters’ inhabitants, whether on or by the water. Nevertheless, I must confess that my favourite was the public ferry, to enjoy the local life both on board and along the canals. I also particularly enjoyed talking to the very pretty Macy. Whenever she saw me alone, she took the opportunity to come and talk about our cultural differences and our different conceptions of life. It was a real joy to answer the questions of this intelligent and curious young woman and to learn more about Indian culture in her company. Before leaving Allepey, I wanted to go back to Kottayam to participate in the elephant procession (Arratu). During these festivities, the divinity of the main temple is taken out of its sanctuary by the ancient Maharaja. Next to him stands a beautifully capped elephant, followed by several others. The procession of about two hours takes you through the city to the sea. The statue is then immersed for ritual ablutions. The procession reaches the temple by the same way, but this time by torchlight. Unfortunately, the day before, a terrible bus accident caused the death of about twenty people and the festivities were cancelled. So I went to Marari Beach, 10 kilometres north of Allepey. To get there, you can take a rickshaw or use the bus service to Kochi. This beach is rather paradisiacal with its white sand, coconut palms, colorful fishing boats, few tourists and children. 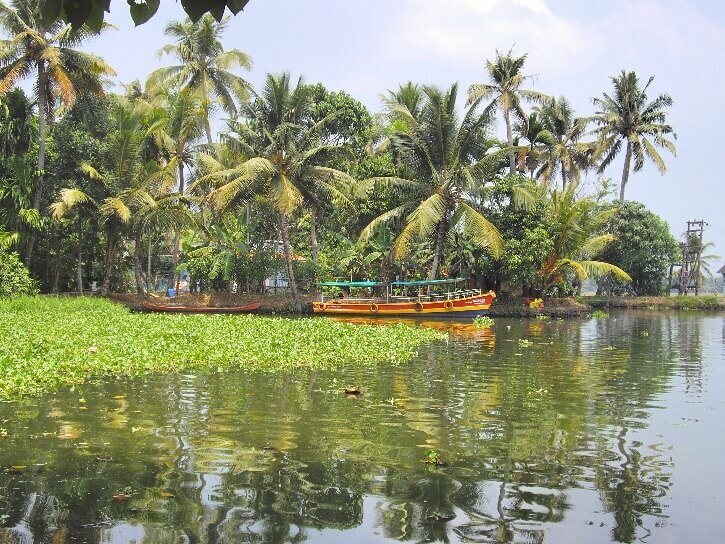 For three hours, the public ferry sails the backwaters through various landscapes. Sometimes the canals are wide, resembling a huge lake or even a sea, sometimes they are much narrower and the ferry never ceases to touch the luxuriant vegetation. Many Catholic churches are scattered throughout the route, sometimes in the middle of the jungle. A few minutes before the arrival, we even pass through an area where the vegetation has completely covered the water. On the way back, one of the crewmen should get naked and enter through the toilet hole to cut the grass caught in the rudder! 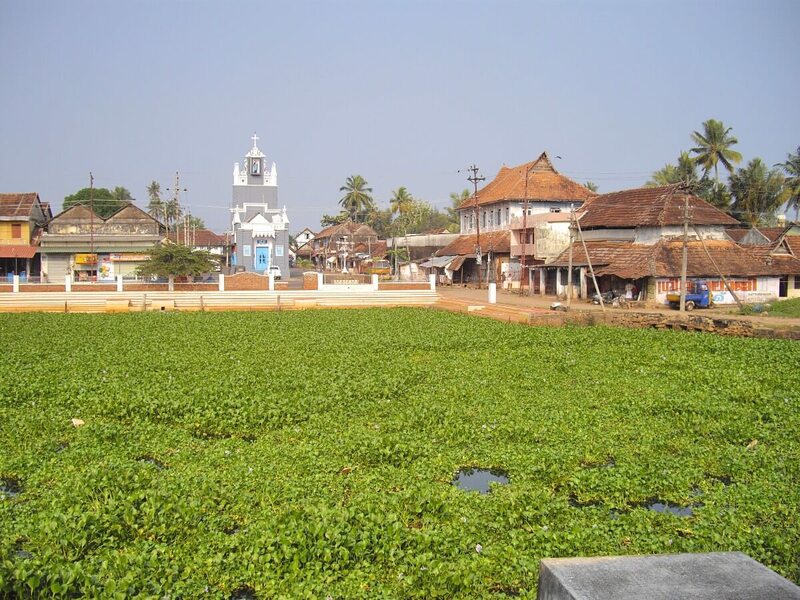 We disembark at the pier, a large pond with beautiful keralaise houses and a blue and white church. My vision of Changanassery will be that of a quiet rural backwaters village. A big mistake: nearly 52,000 people live there, and the city is well known for its excellent schools and colleges. Compared to the national average, it also benefits from an excellent literacy rate (86% against 59.5%), and many inhabitants have emigrated to the Gulf, Europe and America. It is also known for the peaceful coexistence of Hindus, Muslims and Christians. Barely feet on land, I can hear the music of a procession I saw from the boat. I run down to film, before realizing once again my misunderstanding: it’s a funeral! I cut before we saw the body on the chariot. Part of the return journey takes place at night. The life of the backwaters is still as peaceful as ever and the evening light adds a magical touch to the illuminated houses. In the entrances, most of them have a kind of candleholders with candles. After the beauty and calmness of the Periyar reserve and the backwaters, I must confess that I was not a big fan of Kochi, nicknamed “Queen of Arabian Sea”. However, the city is worth to visit for several reasons. Kochi will certainly not be the best memory of my trip. As soon as I arrived at the guesthouse recommended by Biji in Allepey, I feel that everything is only business and the contact with my hosts much more dummy. I’m being offered a drink, with the note that goes with it. I opt not to use air conditioning, but the absence of a fan and aeration forces me to use it… and to pay a substantial extra charge. 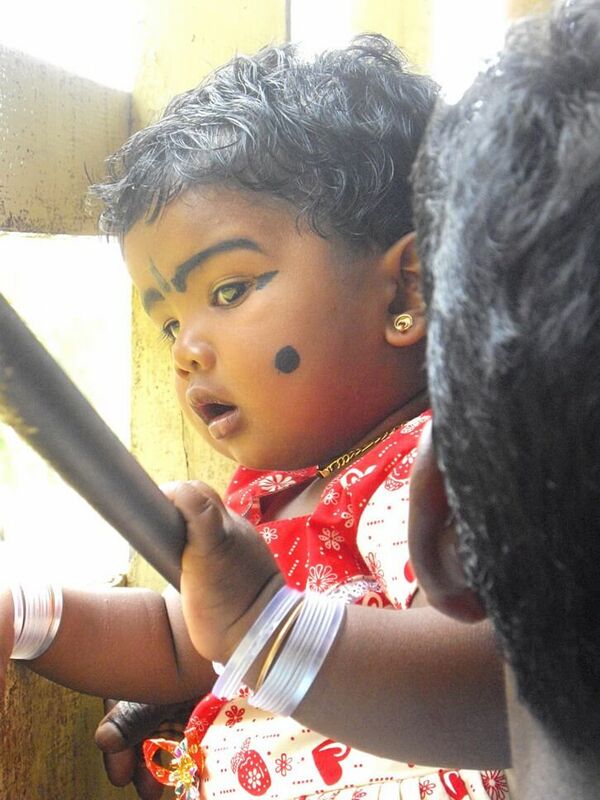 Here, unlike Kumily or Alleppey, we are simply considered for who we are: a customer. Like me, the tourists and Westerners who live here usually make their home in the quiet area of Fort Cochin, the historic heart of the city. It’s a very nice place, but we can feel everywhere how people are interested in our money. One of the interpretations of the name of the city would come from what Co-Chin can be translated as “like China”. This would refer to the famous Chinese nets that were imported in the 14th century by the Chinese explorer Zheng He. Its photogenic structures line up along the coast of Malabar at Fort Cochin. It is at least 20 metres long and 10 metres high. At least six men are needed to relieve them. The Malayalam name is Cheena vala. It is at sunset that the Chinese nets offer the most beautiful pictures. It’s also when the fishermen return and you will discover the products of their fishing, which you can even buy and grill on the street stalls. Unfortunately, once again, it is the tourist who has become the prey of the nets and their touts. Throughout your walk, you will be offered, for a fee, the opportunity to show you the manoeuvring of the net, or even to have your photograph taken while participating. I went to Mattancherry, the area where you can find the old spice counters and the Jewish district, following the seafront via River Road and then Bazaar Road. On Bazaar Road, I was able to attend a Catholic religious feast at the Holy Cross Chapel. If you have the opportunity, don’t hesitate to observe the rituals, very imbued with Hinduism. It is always interesting to see how other cultures appropriate and adapt a religion with a very different origin to their own. The pretty Jeevamatha church, just before arriving at Mattancherry Palace, is also worth a visit. 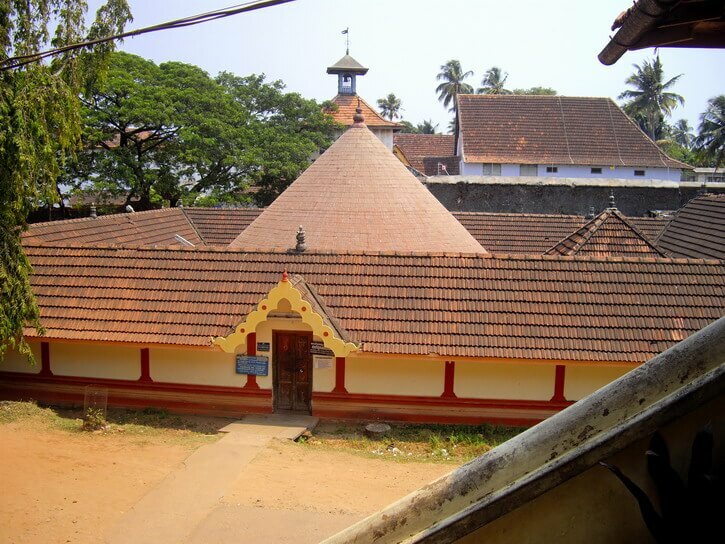 It is one of the oldest churches in Cochin. The palace of Mattancherry, although it is also called the Dutch palace, was built by the Portuguese around 1555, and offered to the King of Kochi. It was enlarged by the Dutch in 1663, then again by the Raja. In addition to its interesting exterior and interior decoration, a mixture of Kerala Nalukettu style and colonial architecture, it contains an exhibition of ancient paintings and describes the life of the Rajas of Cochin through their portraits. Unfortunately, photos are forbidden. The entire Jewish district in the surrounding area is ideal for a long walk between colourful houses, beautifully crafted wooden facades and antique shops. Cochin Jews, also known as Malabar Jews, are the oldest Jewish community in India. Their origins could be traced back to the time of King Solomon. There are less than a dozen left today. The clock tower near the synagogue is a beautiful monument. As for the synagogue, built in 1567, its floor is covered with magnificent blue Chinese porcelain, all unique. It is full of art objects. It is the oldest active synagogue in the Commonwealth. On the other hand, the reception is very unpleasant and you will have to pay an entrance fee (which still shocks me for religious places). Considering the very touristic aspect of Cochin, I had initially decided not to see a show of Kathakali, the classical dance of Kerala. Finally, I let myself be tempted and I really didn’t regret this beautiful evening! Don’t miss the makeup session that begins long before the show itself. It lasts about an hour and you can see each actor using different techniques depending on his character. 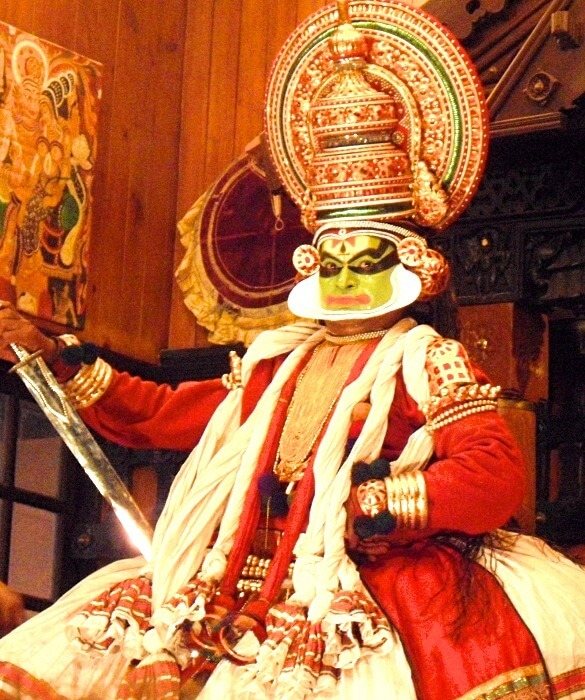 Then, one of the actors demonstrated the many Kathakali face expressions and gestures. You can see it from 3:50 in the video. They also explained the scene of the Ramayana we would see and gave us a booklet containing the story (the meeting of Prince Rama with the ogress). Finally, the show itself, played by the three actors (the prince, the demone and the girl – in reality the disguised demone). If you want to know everything about Kathakali, I invite you to read the excellent article by Meenakshi J Iyer on this art unfortunately on the verge of extinction. The city of Kochi is easily accessible by bus or train from many cities in Kerala. I was able to take a direct bus from Alleppey. To leave, I took the train to Bombay (a very – too – long trip, which I recommend you cut). As mentioned above, Fort Kochi is the most pleasant place to stay in Cochin. Most rooms and suites have a view of the harbour. The building is remarkable, both outside with its clock tower and swimming pool on the terrace, and inside through an extremely neat decoration. Check the latest reviews and prices here. A beautiful house in the middle of the greenery, offering beautiful rooms with wooden furniture and frescoes and a large swimming pool. Read the latest reviews and check the latest prices here. This establishment, ranked 15th of For Kochi hotels, is recommended for its cleanliness and comfort, but also for the excellent welcome and advice of the staff. Check the latest reviews and prices here. Rather than inflicting a basic copy-paste of Wikipedia information on you, I am interviewing my Indian friends so that they can enrich this section over time. Nestled in the Western Ghats and on the banks of the Periyar River near Kochi is Thattekadu which literally means flat forest. However, the dense jungles here are home to elephants which roam freely around here. But Thattekadu is also home to over several species of birds that are endemic to the region. No wonder the famous ornithologist Salim Ali stumbled upon it years ago and the bird sanctuary here is named after him. Lose yourself here in the lap of nature and wake up to the chirps of birds. Go with a naturalist and bird guide in search of the endemic species of birds and roam around the rubber plantations or float in a boat on the Periyar River. Thattekadu is one of Kerala’s hidden gems, tucked away literally in the arms of nature. For more details – see the article of Lakshmi on the birds of Thattekadu. If you want to enjoy the feeling of a small town, take a solo trip to Varkala, located near Trivandrum. The little town is known for its crescent shaped cliff beach, and a slow pace of life. Varkala is also a popular destination for people who want to undergo yoga teacher training. 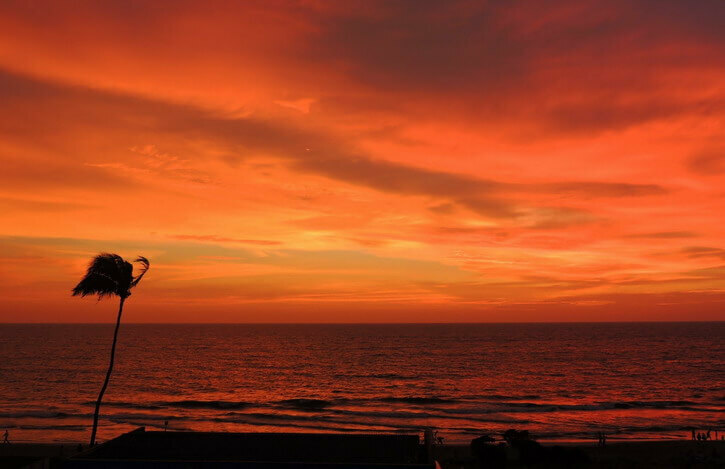 Other popular things to do in Varkala include taking a bike tour, enjoying traditional Kerala food and visiting the popular Janardanaswamy temple. You can reach Varkala from Trivandrum easily by train or public bus. For more details, read Vidyut’s article on Varkala. Say Thrissur and the first one to come in mind is the famous festival “Thrissur Pooram” which happens near the Vadukkunnathan Temple. What seems like a small entrance and small temple from outside is highly deceiving. Spread over nearly 9 acres, Vadukkunnathan temple compound is one of the beautiful places to walk around and find peace. There are about 20 different shrines inside the complex and there is a particular order in which the shrines should be visited which has been mentioned at the temple entrance. The main deity is Lord Shiva which is in the form of Lingam. However this is one temple where you will not be able to see the Lingam idol. The idol is covered in a mound of ghee which has been poured over the Lingam over years and the practice continues every day. What is miraculous about it is, the ghee in spite of being there for years, neither smells nor melts away even in summer. It is a pleasant sight to look at the deity, a mound of ghee glistening in oil lamps lit sanctum, adorned with golden ornaments. The Koothambalam which means the temple theatre always has some performance like dance or musical or instrument going on, making the even a pleasant way to spend. 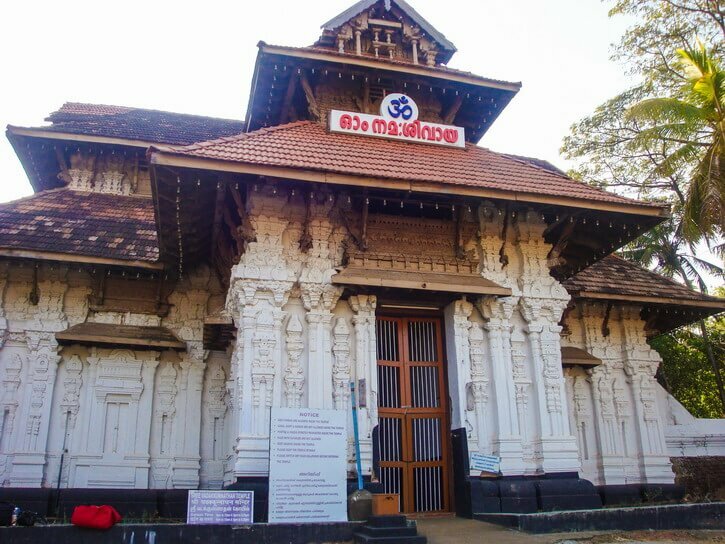 Right opposite the Vadukkunnathan is another temple called the Paramekkavu Bagavathi Temple which is one of the largest Bagavathi temples in Kerala. The famous Thrissur Pooram is held in front of these temples. It is the most colorful festivals of Kerala which involves firework shows, many musicians playing percussion instruments, traditional chenda melam being played and colorful display of crafted umbrellas. It is also the festival where many elephants are decorated with traditional Kerala ornaments and taken on procession. Other things to do at Thrissur is about 50km away from it is the very famous Athirappily waterfalls. It is a famous tourist destination and a famous movie shot location. These tips are given by Chittra M from the blog Masala Box. Indian blogger Saakshi Gulati gives us her impressions of Calicut – Kozhikode and why you should visit this coastal city of Kerala. Calicut – the city of spices! Over five hundred years ago Portuguese sailor Vasco de Gama arrived on the shores of Calicut (Kappad beach), in North Kerala. Calicut still remains fairly untouched by tourism. I urge you to travel to this coastal town of Kerala. Explore the beaches, from Kappad to Beypore. At Beypore, walk on the one-kilometer long pathway that stretches into the sea, if you are lucky, you can watch the dolphins pass by. Enjoy the sunset at Calicut beach with a cup of ‘Sulaimani’, a local variety of lemon tea Take the offbeat trail and discover some hidden backwaters surrounded by swaying coconut trees. Go on a food trail and try some lip-smacking Mappila food cuisine and Kozhikodan Halwa, soak in the history by visiting the museums or shop for some traditional brass artifacts and sarees at the famous SM Street. Calicut truly has something for everyone! Saakshi Gulati also recommends her favourite guesthouse of Wayanad, Amaryllis. Generally speaking, the best time to visit India is between November and February, except for Kashmir (Ladakh and Zanskar included), Himachal Pradesh and the north-eastern tribal states where it is best to visit May to September. Also watch out for the monsoon which can end later in the southeast (December). However, as in the rest of the world, it should be noted that there is a change in the seasons and the monsoon can be very unpredictable. Personally, I tend to plan rather according to festivals: October-November for Bastar Dussehra, Diwali and Central India; January-February-March for Shivaratri and South India. I had been to Ladakh and Zanskar in July-August so that I could go by road. The best time to visit Kerala is between October and February-March. The monsoon is normally over, the temperatures are a little cooler. In March, temperatures are warmer but there are some interesting festivals. The proximity of the sea also makes it easier to withstand heat. ¤ Onam, the biggest festival in Kerala, which lasts 10 days. However, it takes place in August or September and is the festival of the Kerala harvest. Kochi is the place where it’s the most interesting. Various celebrations take place, such as the Serpent Boat Race, the Kaikottikali Dance and Puli Kali processions where artists transform themselves into tigers and hunters. 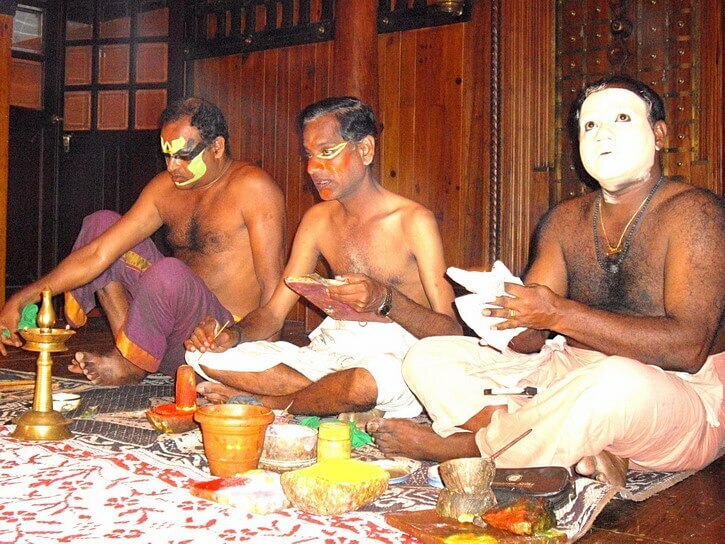 ¤ Theyyam, which takes place mainly from February to April, the dance of the gods or worship heroes. The shows last several hours and the artists wear even more elaborate paintings than in Kathakali. Check Manish’s article and his fantastic photos taken during Theyyam. ¤ Pooram, the caparisoned elephants processions, takes place from February to early May. ¤ Chettikulangara Bharani, one of the most vibrant festivals in Kerala. It takes place in February and March at the temple of Chettikulangara. ¤ Thaipooyam, also known as Thaipusam. In January or February, this festival is not for sensitive souls since the devotees pierce their bodies and wear the kavadis. Kerala has three international airports: Cochin Kochi, Calicut Kozhikode and Trivandrum. In addition to Kerala’s three airports: Chennai Madras, Trichy Tiruchirappalli and Coimbatoire Kovai in Tamil Nadu, Bangalore Bengaluru in Karnataka. For my part, I tend to arrive in Delhi or Bombay and then book a domestic flight to the destination of my choice. India is the only destination for which I do not recommend Qatar Airways, which surprisingly has been charging much too high fares for the Indian subcontinent in recent years. For the first time, I will use another Gulf airline, Oman Air, for my next trip. I paid my return flight less than €340. I hope this article will make you feel confident for your next or first trip to India. Will you visit the important tourist places in Kerala? If you still have any hesitations, please explain why in the comments below. Come back and share your experience with us when you have gone ahead! For advice for women who travel alone, I advise you to read some anecdotes that have happened to me, through which I give you advice to ensure your safety and my 3 worst seduction techniques I’ve faced while traveling. And for more reading on the subcontinent, consult the travel India blog. Have you already visited South India? Which important tourist places in Kerala would you recommend? 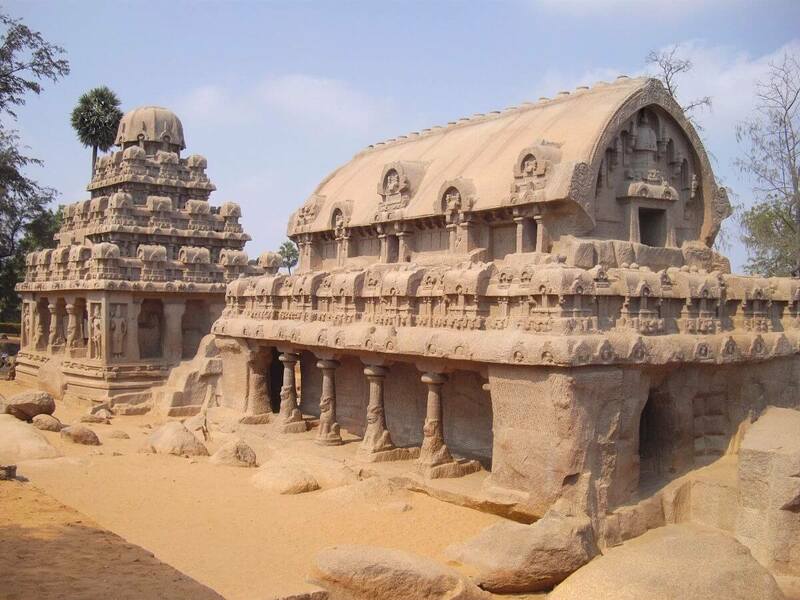 Stay speechless in front of the incredible beauty of Tamil Nadu and its majestic temples. Truly your shared all these places are the best for travelling. I also explored these charming places during my last journey and came back with unforgettable memories. Ooh! This is incredibly informative. Thanks for sharing. I’m headed to India later this year so this should be really helpful.